I am saddened that Beta 5 Ice Cream Socials have once again come to an end and we will all have to make it through the winter months sans delicious sundaes until spring 2017. As a faithful Beta 5 social attendee, I ate through 9 of the 15 sundaes this summer. There were some that I loved while others that just missed the mark for me. Here is a little round up of all the sundaes beginning with the first sundae, the Cherry Cola! I missed out on the Cherry Cola Sundae! Sort of annoyed that I did since the sundae looked fabulous and I can only imagine how amazing it tasted. The presentation was fun with the pink cotton candy and it was great how the flavour mirrored one of their current cream puffs. Hands down, the Raspberry Earl Grey was one of my favourites from this summer. Cadeaux Bakery first got me to call in love with earl grey when I tried their London Fog cake. Pairing the classic tea with the tartness of fresh raspberries (which happens to be one of my favourite fruits!) made for one incredible flavour pairing. I found the lemon completely overpowered the blueberry, so after one bite of the lemon ice cream, I only tasted the strong lemon and nothing else. The lemon curd in the doughnut holes was very intense too. Would have been a great flavour combination of blueberry and lemon, but the two flavours needed to be balanced better. I intentionally skipped the Mint Chocolate sundae because I remember having it last year and disliking the chocolate sorbet and peppermint patties very much. I do love mint straciatella ice cream, but did not want to just go for just a scoop of ice cream. Oh how I wish I could have s'more of this sundae hehe. The ceylon cinnamon ice cream had a good depth of flavour and really balanced out the dark chocolate ice cream. Also, you can never go wrong with anything s'more inspired! They could make the marshmallows a little more gooey and toasted! When I heard that Beta5 was going to do strawberry funnel cake, I was reminded of childhood memories of enjoying this classic fair food at wonderland. Funnel cake is amazing and using it as a topping for this sundae was genius! It tasted so darn good, that it took every ounce of willpower to not go back for seconds! Roasted plums are amazing in any dessert, so it was no wonder that this sundae was delicious! Beta 5's team used three different types of plum to giving you various plum flavours. The Santa Rose Plum sorbet was light and tangy while the honey roasted Shiro plum had just the right amount of sweetness along with tang. Elephant heart plums gave the jelly a deep red colour and refreshing fruity flavour. I ended up missing this sundae, but can only imagine how delicious the jasmine green tea ice cream was. Anything matcha is a win for me! Also, you can never go wrong with poached peaches in a dessert. I actually won the Beta5 photo contest for my piña colada sundae picture; therefore, there is a little bias towards this sundae hehe. It was a heat wave in Vancouver, so I remember this sundae made me feel like I was sitting on a beach in Hawaii. The icy pineapple sorbet was refreshing and paired well with the more subtle and creamier coconut ice cream. Also, how cute is the chocolate coconut! I was intrigued when Beta 5 announced their next sundae would feature a vegetable, corn. I often associate ice cream with fruits and chocolate, not vegetables so I was curious to see how corn will work in one of my favourite iced confections. Unfortunately, I found the corn to be very overpowering and the ice cream felt as though it coated the inside of my mouth in a not so pleasant way. I could barely taste the blackberry and could not manage to get past the strong corn taste. Frankly, I did not even finish this sundae - SHOCKER! Since I am allergic to cantaloupe and honey dew, I gave this sundae a pass. During the summer months, watermelon is one my favourite fruits to eat and I can only imagine how refreshing the watermelon sorbet would be! Also, who does not like frozen yogurt?! AHHHHHHHHH MANGO BUBBLE TEA SUNDAE! My favourite sundae from this year's Beta5 ice cream social! Firstly, Mango all time favourite fruit of mine. Secondly, Beta5 does the most authentic tasting milk tea ice cream I have ever tasted. Fresh mango cubes with japanese bread toast all drizzled with condensed milk.... I would seriously question your sanity if you did not like this sundae haha. I missed this sundae; however, Beta5 did have this exact same flavour combination last year. Black Sesame gives the ice cream a savoury taste; yet, still stays sweet. 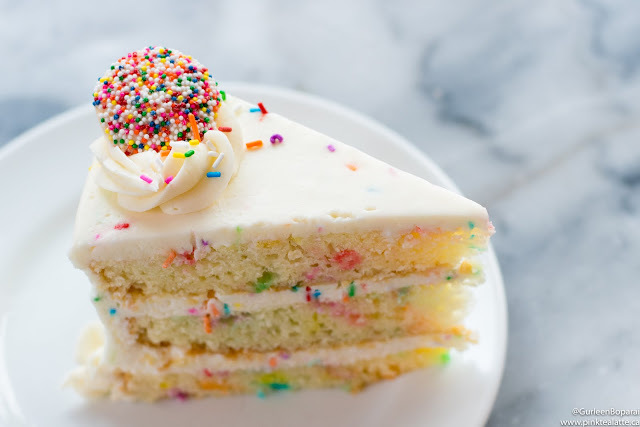 It is a tough flavour to explain, so it is something you need to just try. The black sesame's mild savoury flavour pairs extremely well with the more robust coronation grape sorbet. At first, black sesame will seem a little odd, but it will quickly win you over. I was outraged that I missed the Butter Beer Sundae. I was mortified and threw a huge fit when I realized I would be missing this glorious Harry Potter sundae due to work commitments. I am not exaggerating when I say I cried that night.... yup, I feel as though I have failed as a Potter fan. I can only imagine how magical the chocolate stout and butterscotch ripple ice cream tasted. If only I had Hermione's time turner and could be at two places at once. Please Beta5, fulfill my wishes and bring back the Butter Beer Sundae for 2017's ice cream social. The last Beta5 sundae was the Birthday Bash in celebration of their 5th anniversary. The chocolate straciatella ice cream was creamy chocolatey goodness and I liked how the chocolate pieces were wafer thin; therefore, not overpowering the ice cream itself. The fior de late was on point. Every ice cream flavour begins with the simple fior de latte base. Beta5 is always so creative with their garnishes, so I was a little surprised to see that they kept it very boring for their big 5 year bash. Just pieces of coloured chocolate, chocolate syrup and chocolate cake crumbles. Just a very lackluster presentation when compared to their past creations. 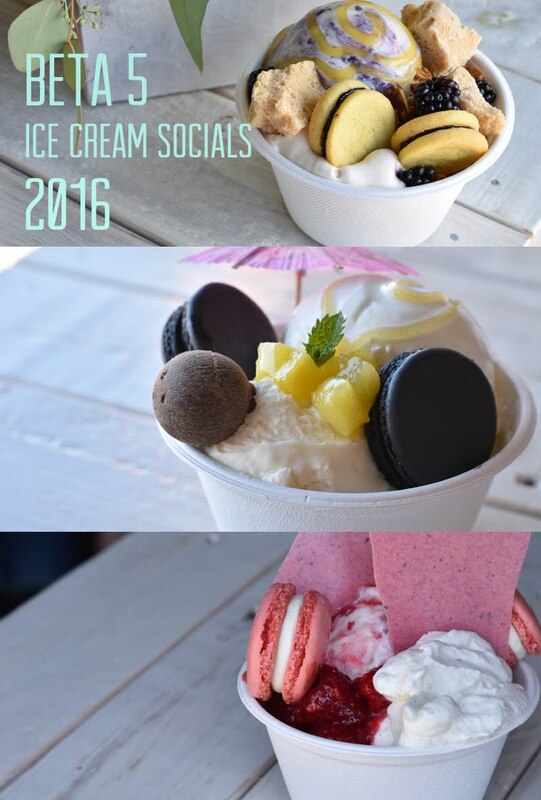 That is the end of the 2016 Beta 5 Ice Cream Social Round Up! It was a fabulous summer full of delicious sundaes. My first pick would be the Mango Bubble Tea sundae closely followed by the Raspberry Earl Grey Sundae. The biggest disappointment would be the Corn Blackberry. Though a very beautiful sundae to look at, the flavours were very unbalanced and the corn was so overpowering that I could not manage to finish the entire sundae. For 2017, I really hope they bring back the Butter Beer as well as the Mango BBT, Raspberry Earl grey and Strawberry Olive Oil. Other flavours that I would like to see would be something with orange, tiramisu, lychee and spiced chocolate! Let me know in the comments below if you attended any of the Beta 5 Ice Cream Socials and which one was your favourite. Also what flavours would you like to see for 2017? Believe it or not, amongst the hustle and bustle of a big urban city, Vancouver is still brimming with talented artisans. Each day, I am discovering new Vancouver-based companies; however, one company that caught my eye when I first started Pink Tea Latte is Pacific Design Lab. I first came across their stunning wood boards at an adorable boutique along Main st., Nineteen Ten. I was instantly drawn to their Fir wood boards finished with a unique flaming method. I finally got to meet the lovely husband-wife duo from the team, Alanna and Brandon, at the IDS West Interior Design Show. 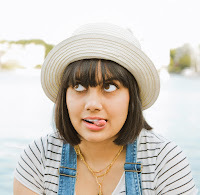 To my astonishment, Alanna was already familiar with my blog and social media accounts. I was beyond flattered when Alanna agreed to have me write a piece on Pacific Design Lab. Pacific Design Lab is the consumer half which organically emerged from the Pacific Solutions Contracting (PSC), first established in 2010. Some of the most iconic Vancouver restaurants to emerge over the past couple of years were creations of Pacific Solutions. These include the Tacofino Gastown location, Nook Kitsilano and the newest much raved about, Fable Diner. 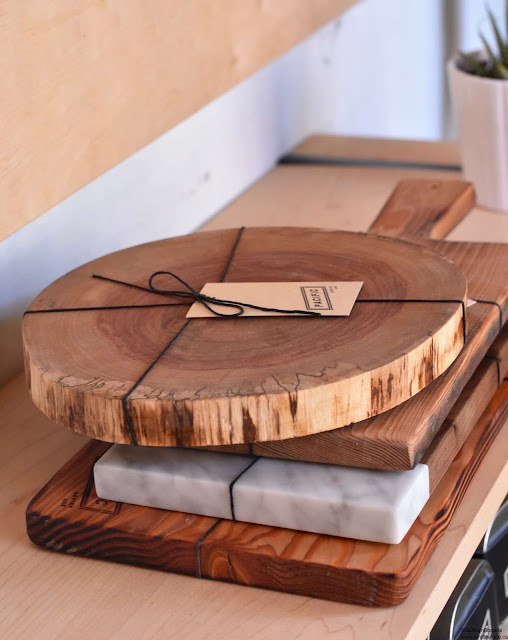 Primarily known for their skilled craftsmanship in woodworking, Pacific Solutions Contracting are versed in many other techniques and have created a name for themselves working with some of the trendiest restaurants in Vancouver. As amazing as PSC is, the creations by Pacific Design Lab are what really caught my attention. Instead of disposing the left over pieces of wood from PSC projects, Alanna and the team turned them into serving boards for personal use. 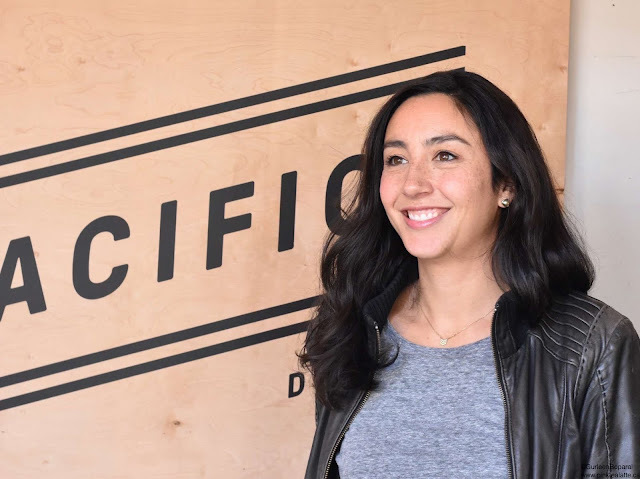 Eventually, Alanna's friends and family were asking for their own, so as the demand continued, Pacific Design Lab was created. 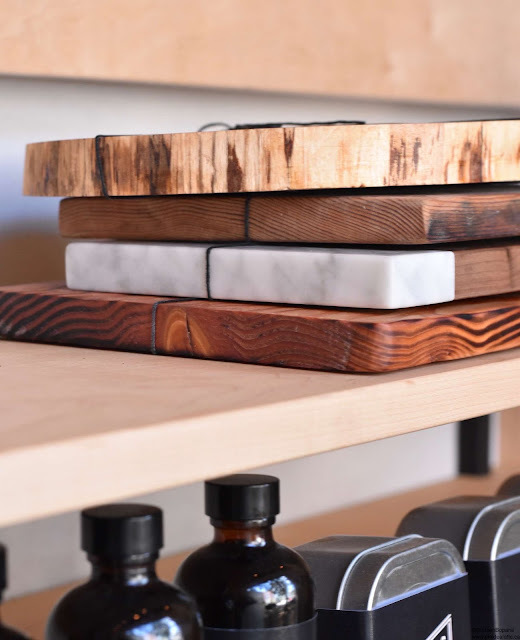 Pacific Design Lab strives to use locally sourced wood. Expect to see a lot of stunning Fir, Maple, Ash and Walnut wood in their pieces. I asked Alanna what style she would call her pieces. Alanna really wanted to embrace her Pacific West Coast roots; therefore, keeps her pieces really organic with a west coast vibe. She wanted to create pieces that accent and highlight the natural beauty of each piece of wood by working with the wood to embrace its character. Therefore, no two pieces are alike, but that is what makes Pacific Design Lab's work so unique and appealing to me! Their pieces are often left with a clear finish, as a coloured stain would obscure the natural grain and beauty of the wood. Coming into their third year of business, Pacific Design Lab is beginning to develop and diversify as a brand. 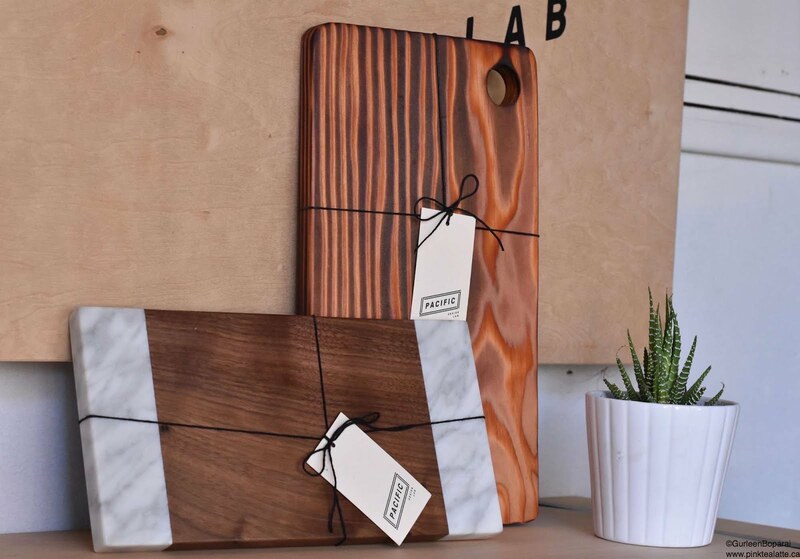 Amongst their beloved wood boards, there is now marble and wood boards as well as their new line of fuse boards. The fuse boards use food safe biodegradable epoxy and really highlights the natural live edge of wood. The clear epoxy is really unique as it joins two pieces of wood together. I would be curious to see them use two different types of wood in one fuse board. In collaboration with Hives for Humanity, Pacific Design Lab has their own line of wood care products. Their wood boards are stunning, but Alanna stressed the importance of good wood care. The bane of all wood is water! Absolutely no dishwashers and minimizing moisture exposure. The key is to wipe your wood down with warm soapy water and immediately drying it with a towel. When your board begins to look dry, apply some wood wax or wood oil to restore the board's luster and colour. In keeping with their commitment to sustainability and supporting local, Pacific Design Lab partnered with Hives for Humanity to create a custom blend of food-safe oils and BC bees wax. For those of you unfamiliar with Hives for Humanity, it is a non-profit organization that strives to foster community relations with their sustainable projects. I asked Alanna what we can expect to see in the future from Pacific Design Lab. She has always wanted to create her own line of furniture. They have just begun the transition by doing the E 28 Collection, exclusive to Nineteen Ten. The three pieces in the collection (Station Block, Main Bench + Prior Table) are constructed from reclaimed butcher block wood and stainless steel frames for an elegant yet durable piece. Earlier this year, they debuted the Access Collection (available online and select retailers), Pacific Design Lab's first stand-alone furniture collection that is designed to get people outside and into the community! I cannot wait to see how Pacific Design Lab flourishes in the future! With the holiday season fast approaching, the team at Pacific Design Lab and Pacific Solutions have an exciting initiative coming up. Raising money for the Terry Fox Foundation’s fight to end cancer, the team has created a 2017 charity calendar that will see all proceeds going to the cause. These will be available starting in November, just in time for the annual West Coast Winter pop-up taking place on Saturday, November 26th. The Pacific workshop will be transformed into a market and community event that sees local vendors selling their handcrafted items (perfect for holiday gift shopping! ), food trucks, local craft beverages, and a community long table to meet and be merry. Entry is by donation and supports the WISH Foundation, a non-profit to help women in Vancouver’s East Side. Follow the event on Facebook here for the full details. I appreciate Alanna and the Pacific Design Lab for inviting me to their workshop in Chinatown, Vancouver. I had so much fun touring their work-space and seeing up close the amount of time and passion that goes into each and every one of their pieces. Hope to stock up on a few of their stunning wood boards myself! You can find their pieces at several boutiques across the lower mainland as well as their online store.